This is a short Topic. It is a curious action we can perform in Access. Up to now, we have use Tables to create Queries, or with Calculating Fields. However, Access allows us to perform Queries over other Queries as Base. We do this to save time when creating new Queries. For example, if we already have a Query on the purchase made by a Client, we can use it to calculate our new balance with it. Then, we wouldn't have to add more fields or apply more criteria to get the data we already have in another table. 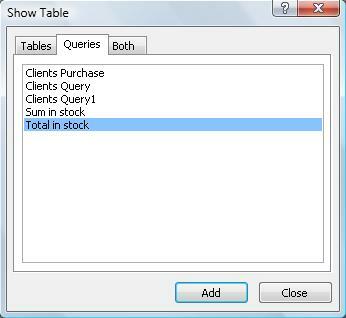 Simply, we would need to click on the "Queries" tab from the "Show Table" window, in the Design View when we create our Query. 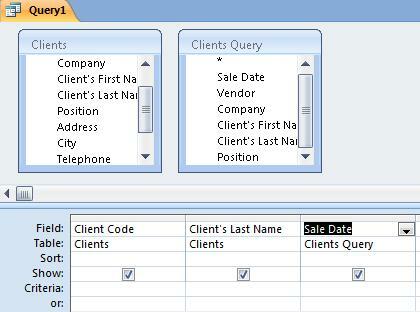 We can create Queries using only Queries or we can combine Queries with Tables. Don't forget that if we are using data coming from Queries, we won't be using original data, but only the data that complies with the conditions expressed in the Query we are using. If we forget this, we can find unfortunate surprises with our results.